This dynamic encounter is similar to the Omnotron Defence System seen in Blackwing Descent as we will be fighting multiple mobs with an energy bar that we need to monitor and some very have special abilities for us to avoid. They have a shared health pool of 130m and a Solid Stone buff that prevents 90% of damage. This buff drops of when a Guardian is within 12 yards of another Guardian but also allows Guardians to gain energy and when a Guardians energy bar reaches 100% it Overloads which will deal a raid wide. A random Guardians will also apply a petrification effect (shown by an additional frame on your screen) which prevents 90% of the damage from its Overload attack. Therefore, the basic strategy is to match the order of the Overloads with the order of the petrification. After 80 seconds the the raid becomes petrified and will most likely cause a wipe as we will be unable to move or use any abilities. To prevent this we need to force the Guardian applying petrification to Overload by making it reach 100% energy by always having the petrifying Guardian next to the Guardian with the lowest amount of energy. Tanks will need to taunt frequently to ensure that the petrifying Guardian is in next to the lowest energy Guardian. This also means that DPS needs to watch their threat to ensure the tanks are not taunting too frequently resulting in the mob becoming taunt immune. 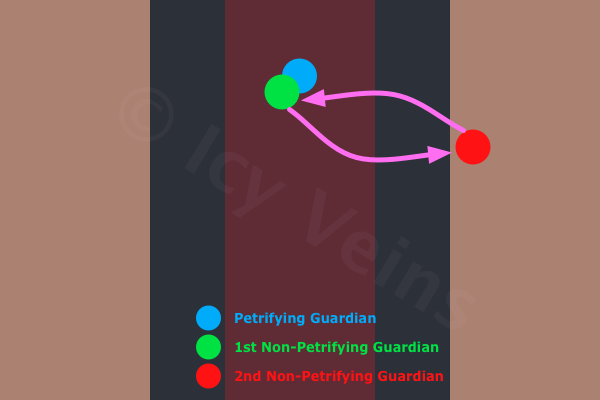 The petrifying Guardian and the lowest energy guardian should be tanked in the middle of the room with the lone guardian being tanked to one side. As DPS should ONLY be on the 2 guardians in the middle of the room melee DPS should be beating on those 2 Guardians. Ranged DPS and healers should be stacked close to each other on the red carpet area. This will mean that they will need to be quick to move away from the Amethyst Pool void zones and the Cobalt Mines. If affected by Jasper Chains the affected players will need to stay close to each other and move together to avoid massive damage. After a short time space will become an issue, to help ease the problem it is possible to detonate the Cobalt Mines by a designated person who must ensure that nobody else is within 8 yards of them. This should only be done during Cobalt Petrification.